Like our style? Fill us in on your aha insurance experience. Yes! I give aha insurance permission to use my name, story and profile picture in marketing materials. Insurance products are created for individuals; one product does not fit all. To create your policy, we not only need to learn about your history as an owner or insurer of an automobile or property insurance, but we're in-fact required by law to keep certain information on record – we simply must get to know you before we write your policy. For you, the customer, this means you must trust not only your Broker and insurance provider, but the network of organizations that play separate but essential roles in delivering, servicing, fulfilling and regulating your insurance products. By signing off consent to aha insurance, you're allowing us to create a record of your personal information. This record will have both information you've provided and information we've gathered from third-parties. For example, we'll ask for your driver's licence number so we can retrieve your driving and claims history from an organization that maintains a database of these records for everyone in Canada. If you're applying for home insurance, our underwriting insurance company, Zenith Insurance, will retrieve your credit score from a credit reporting agency, this may provide you with an additional savings. If you prefer to receive a quote without providing credit consent, please contact our office and we will gladly assist. Providing credit consent is voluntary and property quotes can be obtained through our office without credit. We may also engage third parties to assist in providing, servicing and fulfilling insurance products, as well as in assessing insurability. These companies may also collect your personal information to fulfill these roles. By agreeing to this policy, you agree to let aha insurance order reports to review your driving and insurance history to provide you with a quote. You have also obtained the permission of other drivers listed on your policy to let aha insurance order their driving and insurance history report. As you obtain quotes and use the self-service options on the website, you'll provide information like your email, licence number, name of the institution your mortgage is with, names of your current insurance providers, and many other possible details. We hope you'll join our communities, where you may provide additional information, such as the story of a positive experience with aha insurance. Finally, someone from the aha insurance team may add information to your record that originated in an email, a phone call, or a live-chat session. For example, you may speak with a Broker on the phone about a claim that becomes part of your claims history. Your information is used to help us in achieving our goal to provide you with products and services that meet your ongoing needs. We may verify your personal information that you provide us with at the time of your application for insurance, and will use this information as we assess your situation in accordance with our insurer's terms, policies and conditions. This review of your information helps in determining pricing as well as product eligibility. We also protect our customers by taking all appropriate measures when it comes to detecting and preventing fraud or other illegal activities. From time to time we may conduct market research, analyze business results, and/or compile statistics and report to regulatory bodies and other industry entities acting as required or authorized by law. While aha insurance is a company based in the digital era, we do in fact have a very real office located at 615 Kumpf Drive in Waterloo, Ontario, where our Brokers receive phone calls and emails, and where our private-server stores records of customer information. Our Chief Information Officer, is responsible for the security of our digital records. The CIO is also responsible for sourcing what avenues we transfer information through, what cloud and collaborative working services we use, and, of course, what security systems are put in place. The entire aha insurance team is confident in the security of our systems, and that confidence extends to all employees and everyone involved in the insurance network. Every employee, vendor and business partner's aptitude for handling confidential information is carefully considered before they are authorized to access or use personal information. Unless you request otherwise, we keep your contact information for a minimum of one year so we can send you news, updates and promotions regarding aha insurance's services. An option to unsubscribe from our marketing and promotional emails is always available, and in the case that the unsubscriber is not a customer or member of our communities, unsubscribing will delete their email from our system. Subject to applicable law and some narrow exceptions, all other information is disposed of as soon as it's no longer required for the purpose for which it was collected. As noted, there are some exceptions to this rule. For example, we may have to keep records of information, or even hand information over, in the event of a court order or other legal requirement. Although aha insurance has no need to keep permanent records (unless by court order), your claims history will be ordered when applying for insurance. If aha insurance is unable to resolve your privacy concerns to your satisfaction, you have the right to contact your privacy regulator. Our Privacy Office will give you this contact information upon request. 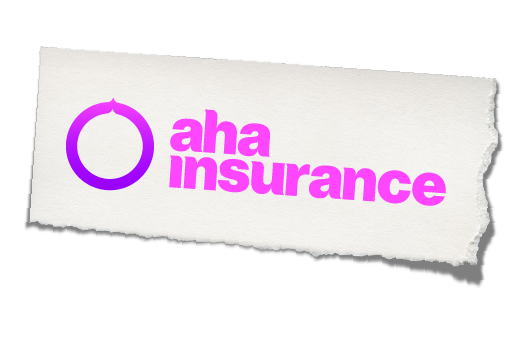 The aha insurance website is an interactive and multi-functional space, so the terms set out in this document are significant for all customers. Customers using the website are expected to understand these terms and keep up to date with changes. Updated versions are logged at the bottom of the document. The aha insurance website provides a self-serve option for purchasing insurance products. By using this option the customer agrees to all terms set-out in this paragraph regarding payment for their insurance products. 'Premium payments are made either as monthly withdrawals from the customer’s bank account or credit card or as a single annual payment by credit card or the customer's bank account. A charge of $45 will be applied if a payment has been returned due to insufficient funds. In the event of a returned bank withdrawal, we may schedule a second withdrawal. A returned or dishonored deposit of the customer’s first installment will result in termination of the policy. More than one payment on the customer’s policy may result in termination and affect the customer’s future insurability. A method of guaranteed funds will only be accepted if a policy is pending cancellation for non-payment. By using the website, the customer agrees to providing information to aha insurance with a full commitment to accuracy and honesty. This means the information the customer provides must be completely true and accurate unless an exception is stated on the website. An example of an exception is the field “Annual kms driven” in the auto-quote section, which allows for some error in the customer’s calculation, and simply asks for the customer’s best possible estimation. We retain the right to refuse services and products to a customer that fails to show a full commitment to accuracy and honesty when using the aha insurance website or when communicating with an aha insurance employee. If aha insurance finds that a customer has provided false information we will exercise the authority to discontinue providing insurance services, to deny pay-out on a claim, and to take legal action against the customer.